Made from pasteurised milk. Origin From the Auvergne region of Central France, an area renowned for its centuries-old tradition of blue cheese making. Made with milk from cows that graze on the rich grass of the region's volcanic pastures, it has a rich blue taste and creamy texture. 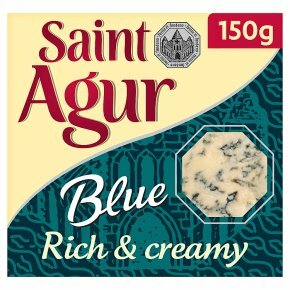 Serving Suggestions The irresistible taste of Saint Agur makes it the centre of attention on any cheeseboard. Delicious on crusty bread or as a snack spread on toast. Ideally complemented by a full-bodied red Burgundy, a sweeter white such as Sauternes or a glass of Port. To enjoy Saint Agur at its best, remove from the fridge an hour before serving. A small amount of whey, a naturally occurring liquid, may be found in the pack.